Alpha decay is ane insaumple teep o radioactive decay, in whilk an atomic nucleus ootpits an alpha particle, an tharebi transforms (or 'decays') intae an atom wi a mass nummer decreased bi 4 an atomic nummer decreased bi 2. Mony ither teeps o decays is possible. Radioactive decay, an aa kent as nuclear decay or radioactivity, is the process bi whilk a nucleus o an unstable atom loses virr bi ootpittin pairticles o ionisin radiation. A material that spontaneously ootpits this kin o radiation—whilk includes the emission o energetic alpha pairticles, beta pairticles, an gamma rays—is conseidered radioactive. Certaint heichly excited short-lived nuclear states can decay throu neutron emission, or mair rarely, proton emission. Radioactive decay is a stochastic (i.e. random) process at the level o single atoms, in that, accordin tae quantum theory, it is impossible tae predict when a parteecular atom will decay, regairdless o how lang the atom haes existit. Houiver, for a collection o atoms, the collection's expected decay rate is characterized in terms o thair measured decay constants or hauf-lifes. This is the basis o radiometric dating. The hauf-lifes o radioactive atoms hae na kent upper leemit, spannin a time range o ower 55 orders o magnitude, frae nearly instantaneous tae far langer than the age o the universe. The decaying nucleus is cried the parent radionuclide (or parent radioisotope[note 2]), an the process produces at least ane daughter nuclide. Except for gamma decay or internal conversion frae a nuclear excited state, the decay is a nuclear transmutation resultin in a daughter conteenin a different nummer o protons or neutrons (or baith). When the nummer o protons changes, an atom o a different chemical element is creautit. The first decay processes tae be discovered war alpha decay, beta decay, an gamma decay. 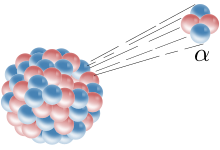 Alpha decay occurs when the nucleus ejects an alpha particle (helium nucleus). This is the maist common process o emittin nucleons, but heichly excited nuclei can eject single nucleons, or in the case o cluster decay, specific licht nuclei o ither elements. Beta decay occurs when the nucleus emits an electron or positron an a neutrino, in a process that changes a proton tae a neutron or the converse. Highly excited neutron-rich nuclei, formed as the product o ither teeps o decay, occasionally lose energy bi wey o neutron emission, resultin in a chynge frae ane isotope tae anither o the same element. The nucleus mey captur an orbitin electron, causin a proton tae convert intae a neutron in a process cried electron captur. Aw o thir processes result in a well-defined nuclear transmutation. Bi contrast, thare are radioactive decay processes that dae nae result in a nuclear transmutation. The energy o an excitit nucleus mey be emitted as a gamma ray in a process cried gamma decay, or that energy mey be lost when the nucleus interacts wi an orbital electron causin its ejection frae the atom, in a process cried internal conversion. Anither teep o radioactive decay results in products that vary, appearin as twa or mair "fragments" o the oreeginal nucleus wi a range o possible masses. This decay, cried spontaneous fission, happens when a lairge unstable nucleus spontaneously splits intae twa (or occasionally three) smawer daughter nuclei, an generally leads tae the emission o gamma rays, neutrons, or ither particles frae those products. ↑ See Wu experiment amang ither coonterexamples when the decayin atom is influenced bi freemit factors. ↑ Litherland, A. E.; Ferguson, A. J. (1961). "Gamma-Ray Angular Correlations from Aligned Nuclei Produced by Nuclear Reactions". Canadian Journal of Physics. 39 (6): 788–824. doi:10.1139/p61-089. ISSN 0008-4204. ↑ "3. Nuclear and Atomic Spectroscopy". Methods in Experimental Physics. 13. 1976. pp. 115–346. doi:10.1016/S0076-695X(08)60643-2. ISSN 0076-695X. ↑ Martin, B. R. (31 August 2011). Nuclear and particle physics: An introduction (2nd ed.). John Wiley & Sons,. p. 240. ISBN 978-1-1199-6511-4.